Rolling Stone has taken a newsstand publication, The Beatles: The Ultimate Album-by-Album Guide, and converted it into an iPad app. The result, for the most part, is excellent. The publication, which costs $10 on newsstands, also costs $10 as an iPad app. And you do get your money’s worth. 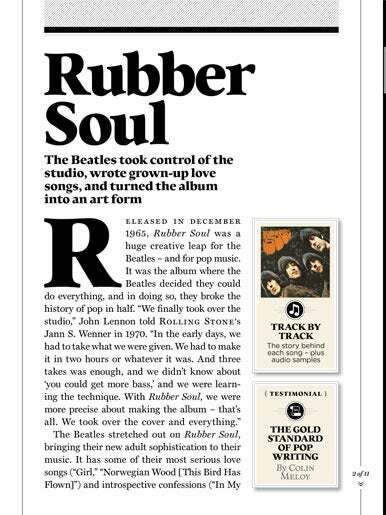 The app includes all of the text that is in the print publication, which means that every Beatles album gets a thoughtful review, some get “short appreciations” by such notables as James Taylor, Liam Gallagher, and Liz Phair, and every song gets a capsule review. In addition there are many photos of the band in a variety of settings: in the studio, on stage, backstage, goofing around, and so on. Along with each song’s description, you can tap an arrow button, and hear a 30-second sample of the song. The Word: Rolling Stone’s app begins its look at each Beatles album with a thoughtful overview essay, and then goes deeper with an additional short essay and track-by-track descriptions. New Beatles fans, and those taking a first dip into the story behind the music, will find this app chock full of great background information. Much of this is well-trodden territory, covered in scores of books (Steve Turner’s A Hard Day’s Write is just one notable example), magazines, and documentaries, but even true Beatles aficionados are likely to uncover some previously unknown details. The app’s biggest failing is that it does not take advantage of readily available multimedia: The Beatles produced and released many promotional films after they stopped touring in 1966, and most have been available on YouTube for years, but the app does not provide links to these. And if you already own any (or all) of the tracks and have them on your iPad or on your home network, the app does not provide a way to access your iTunes library, so that you can listen to complete songs from within the guide. You can use links within the app to jump to an iTunes Store page from which you can purchase songs and albums. So you can preview and purchase, but not play entire tunes, even if you’ve already laid out $150 for The Beatles Box Set on iTunes (or bought the CDs). These are just a few of the opportunities that Rolling Stone had to incorporate multimedia into the app, and give readers a compelling reason to purchase it instead of the print publication. The photos included in the app are terrific, but you can’t zoom in on them—their size is their size, just as in print. Which for the most part simply means that this is really more ebook than app, and that Rolling Stone needs to do a lot more work if it is truly seeking to take advantage of the capabilities of the iPad and related new technologies.